After 35 years at the forefront of luxury fashion, Versace barely needs an introduction. The ever-iconic Italian fashion house is synonymous with a more-is-more philosophy when it comes to glamour and this sentiment is certainly not lost on its home collection. Its creations are designed by contemporary artists and crafted with Italian finesse, which has led the brand to become an international symbol of excellence. 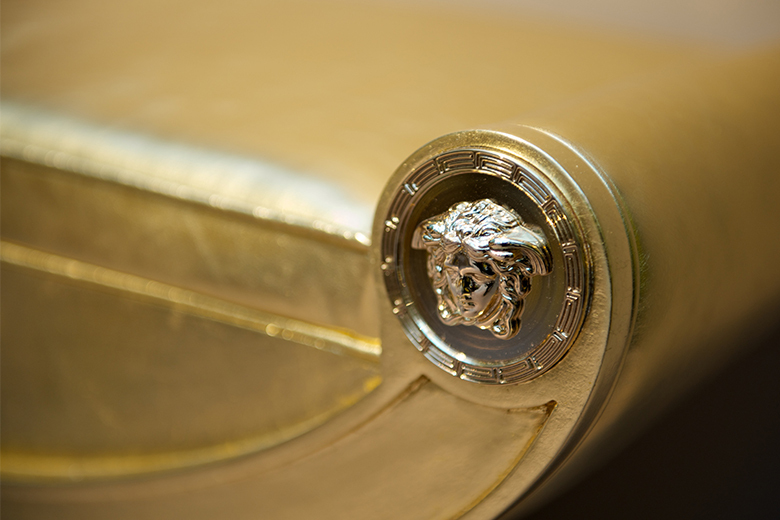 Its masterful fusion of modern design and classical motifs makes Versace Home the answer for those with an intolerance to ordinary interior design. Considering the success of Versace today, the brand’s story began relatively recently in the late 1970s when the fashion house was founded by Gianni Versace. Like so many respected Italian brands, Versace was essentially founded as family firm with both Gianni’s younger sister, Donatella, and older brother, Santo, helping out in the business. After the founder’s tragic death in 1997, both siblings’ roles expanded dramatically as Donatella inherited the position of creative director and Santo took reign as CEO. Under their watchful gaze and guidance, the brand moved full throttle from fashion house to a fully-fledged lifestyle brand. Growing from strength to strength, Versace has expanded into fragrances, hotels, accessories and homeware, and now boasts around 100 boutique stores across the most fashionable cities in the world. 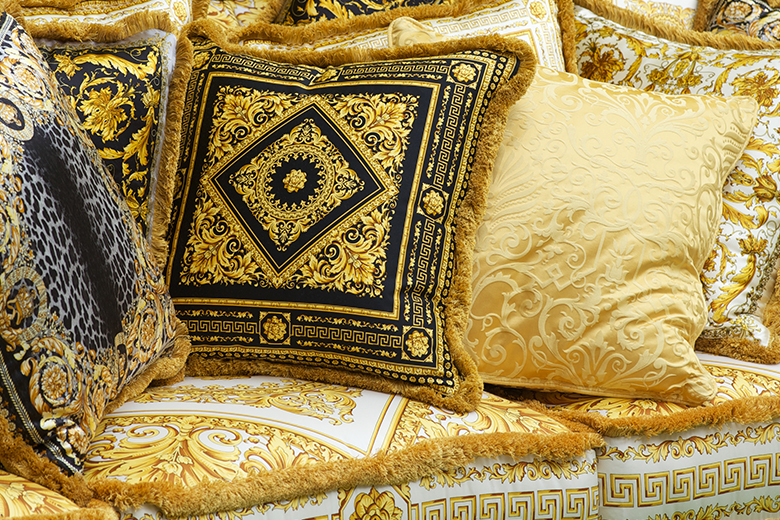 Versace first dipped its toe into homeware in 1992, tackling textiles followed by porcelain dinnerware. The brand then went on to create everything from furniture lines to lighting and wallpaper, keeping the late founder’s love for theatre, sculpture, dance and painting alive in its designs. It’s this nod to all art forms that exalts Versace Home’s creations from humble home furnishings to actual works of art and makes the interior design-obsessed weak at the knees. Versace’s sartorial lines are evidence of its expertise in working with materials, so it’s unsurprising that the brand really excels in soft furnishings for the home. Pure silk, super-soft cotton and velvet are firm favourites and usually the fabrics of choice for its exquisite cushions, bedding, towels and rugs. Daring prints are also an integral element to many of its textile pieces. 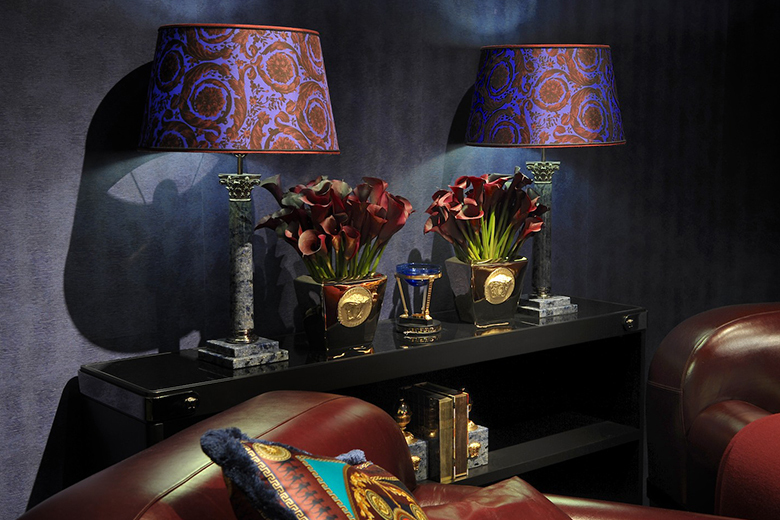 Whether Versace Home makes use of animal patterns or Baroque motifs, it’s always a spellbindingly beautiful result. When it comes to the imitable brand’s wealth of tabletop accessories, they’re packed with classical personality. 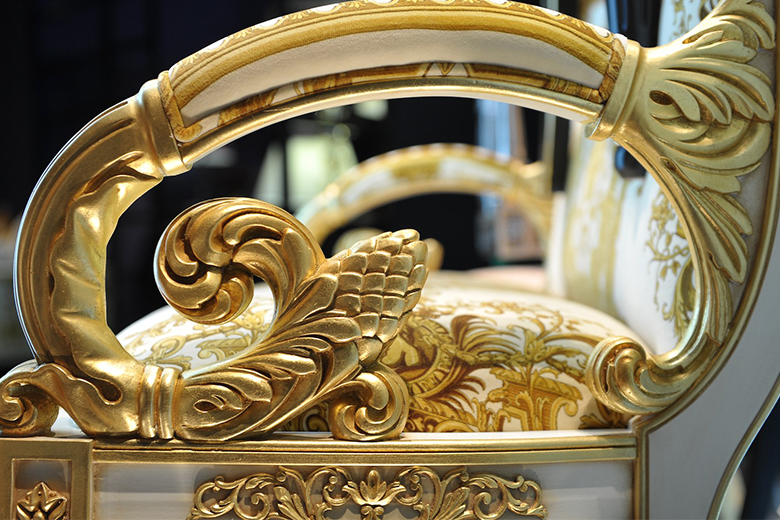 Greek and Baroque emblems are ubiquitous across its vases, ashtrays and dinnerware, which are sculpted with a strong presence of crystal and porcelain by esteemed tableware brand Rosenthal. Marble, golden accents and silk shades distinguish its table lamps, making lighting another area in which Versace Home conduct a fantastical symphony of workmanship and style. And let’s not forget its other collaborative projects with Rosenthal to create fashionable stemware, silverware and china dinner-party essentials. 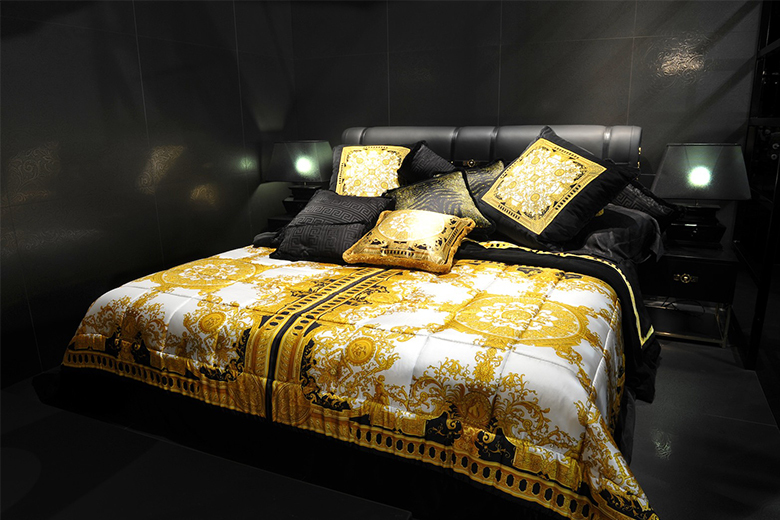 Last but certainly not least, Versace Home’s portfolio of fashion-forward furniture consists of out-of-this-world designs. Colour palettes often revolve around black, gold and white shades, and are juxtaposed with slick lines. Donatella Versace, Vice President and Creative Director, admits, “The furniture of fashion labels should be recognisable. I do not believe in minimalism because minimalism is everywhere.” Excess is clearly the quintessence of the brand when you take a look at its show-stopping leather beds, seating options with an overstated attitude and storage solutions fit for five-star hotels. Oversized damask patterns, the use of gold and silver foil, as well as tasselling all add up harmoniously to create some of the most luxurious furniture pieces you’ll ever set your eyes on.